Islands of meaning in a morass of incoherence. 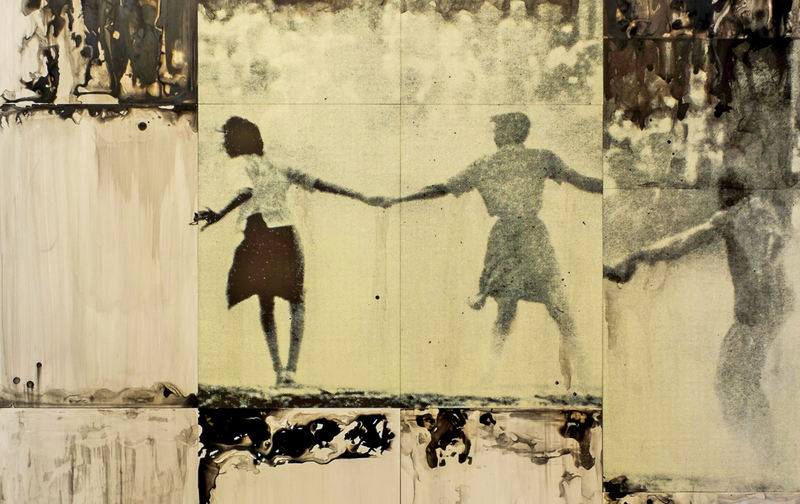 ‘Three Figures,‘ by Lorna Simpson. At the beginning of his essay in the catalog for this year’s Venice Biennale, Okwui Enwezor asks: “What do we see? A void of nothingness? A horizon of possibilities? What to do?” Enwezor is describing, perhaps more accurately than he realizes, the perspective of the visitor to the Venice Biennale—not just this year’s (of which Enwezor is the artistic director and curator), but any biennale curated by anyone in recent memory. “Leap into the void or into the fray?” These are the possibilities that Enwezor envisions, but there are others, one being to turn back and walk away. Which is what I did, inadvertently, two years ago: Having decided not to attend the preview of the 55th Biennale—thinking that I’d be able to see much more if I visited the show later, when the crowds would be less overwhelming—I never quite got myself sufficiently organized to plan the trip. And that was a shame, because Massimiliano Gioni’s 2013 Venice Biennale, “The Encyclopedic Palace,” might have been among the more interesting ones. Maybe I should just admit to myself that the attendant social whirl, though it distracts from the Biennale’s art, is partly what attracts me, or at least motivates me to go. As Enwezor observes, while “art can seek protection from the purifying fury of earnest concern by withdrawing from the disordered affairs that torment women, men, and the world,” and while it’s “the right of every artist to strike such a stance of radical refusal,” an exhibition is also “something that happens in the world, and carries with it the noise, pollution, dust, and decay” that are the world’s lot. And never more so than when the art world descends all at once like a plague of locusts. This year, I resumed my old habit and attended the preview. Besides, there was a special reason to do so (and here comes what they call the “full disclosure” part): Among the artists exhibiting in the national pavilions of the Giardini della Biennale were two close friends. Moreover, my daughter was one of the six young featured performers in the videos that Joan Jonas made for the American pavilion, while Tsibi Geva, whose work occupies the Israeli pavilion, was also the subject of a traveling exhibition I’ve curated. It’s been shown in Washington, DC, and Rome and is about to open at the Mönchehaus Museum of Modern Art in Goslar, Germany (July 2–August 9), so I had to be there in support. This year, as ever, the Biennale resembles the world in another way: It is more than you can possibly absorb in the allotted time. The Biennale encompasses not only Enwezor’s curated exhibition in the Arsenale and the Central Pavilion of the Giardini, but also the 80-plus national pavilions—many of them sited not in the Giardini, but in far-flung palazzi throughout the city—and the 40-plus “collateral events” taking place all over town. Aside from the art itself, an ambitious trek through all of these would involve many hours traversing Venice on foot and by vaporetto. There are also a great many videos; while some are very brief, others stretch on for hours—and if you wanted to see them all properly, from start to finish, you’d have to spend a lot of time just killing time until they began. In other words, to faithfully see everything in the Biennale would take weeks. But an enterprise on this scale can no more be thoroughly curated than it can be thoroughly seen. While it’s always possible to have a profound response to individual works, it is practically impossible to have more than a fleeting, superficial encounter with the Biennale as a whole. Perhaps the Venetian landscape makes an apt metaphor for the exhibition: islands of coherence and meaning amid a lagoon of randomness. A ticket to the preview gets you in for three days. I had four days to explore. Arriving a day early, before the Giardini or Arsenale could be broached, I spent my first day, Tuesday, exploring a couple of the collateral exhibitions that had already opened—“My East Is Your West,” a presentation of the Indian artist Shilpa Gupta and the Pakistani artist Rashid Rana under the auspices of the Gujral Foundation at the Palazzo Benzon, and “Sean Scully: Land Sea” at the Palazzo Falier—as well as several shows not under the Biennale umbrella: “Cy Twombly: Paradise” at the Ca’ Pesaro Galleria Internazionale d’Arte Moderna; Jimmie Durham’s “Venice: Objects, Work and Tourism” at the Fondazione Querini Stampalia; and Peter Doig at the Palazzetto Tito, which belongs to the Fondazione Bevilacqua La Masa. (At the Punta della Dogana, fiefdom of the gazillionaire art collector François Pinault, an officious young Frenchman took great pleasure in dismissing my press card: “Not properly accredited!” he gleefully proclaimed.) While coming and going around Venice, I noticed a change since I was last there, four years ago. The peddlers stationed along tourist routes like the Riva degli Schiavoni no longer sell fake designer bags or souvenir trinkets; now they almost exclusively trade in selfie sticks. Wednesday was given over to an exploration of the Giardini, where, along with the American and Israeli pavilions, I found the Polish and Belgian ones the strongest. Thursday was the Arsenale. On Friday, my last day in Venice, I revisited the Giardini and the Arsenale to see what I’d missed or scanted the first time through. What’s funny about this flare-up—tragic-funny, I mean—is that the Venetian authorities have given a new turn to that old question: “Is it art?” In 1917, when Marcel Duchamp proposed to exhibit a urinal, his colleagues at the Society of Independent Artists forbade it on the grounds that nothing so profane could possibly be a work of art; by contrast, the city of Venice apparently holds that nothing so holy as a place of worship could be likewise. (It has, one might want to say, too much meaning.) In any case, the installation was quickly shut down. For now, Büchel and the project’s sponsor, the Icelandic Art Center, are continuing the legal battle to reopen The Mosque (or the mosque, whichever it is). Despite having called this year’s Biennale “All the World’s Futures,” Enwezor has his eye “turned toward the past,” much like Walter Benjamin’s angel of history, whom he cites at the beginning of his essay. Well, that shouldn’t be entirely surprising: The curators of recent major exhibitions, both national (the 2014 Whitney Biennial, helmed by Stuart Comer, Anthony Elms, and Michelle Grabner) and international (Carolyn Christov-Bakargiev’s 13th Documenta in 2012, Gioni’s 2013 Biennale, and Bice Curiger’s in 2011), have been resolutely backward-looking. These exhibitions focus less on what artists are doing right now and more on what curators are thinking, even if the subject of their thoughts is an old one. And many of the contemporary artists they include are spending much of their time archiving and cataloging others’ past efforts. At Enwezor’s Biennale, in which the great majority of works on view are recent, the impact of the older works revived for the occasion is inordinately strong. Among the first to be seen in the Arsenale is a group of Bruce Nauman’s neon sculptures, some from the early 1970s and others from the early ’80s. In a roomful of works by Hans Haacke at the Giardini, all but one date from 1964, 1965, or 1973. A large number of welded-metal sculptures by Melvin Edwards—a truly underrated artist—constitute a sort of mini-retrospective, with pieces dating from 1964 through 2012. The honored dead are here, too. I somehow missed the projection of Sergei Eisenstein’s 1925 feature Strike, but I did see works by Robert Smithson (sometimes in collaboration with Nancy Holt), Pino Pascali, Marcel Broodthaers, Chris Marker, Fabio Mauri, even Walker Evans, alongside art rarely seen in Europe, such as a painting by the great Australian abstractionist Emily Kame Kngwarreye (c. 1910–1996). New to me was the Egyptian artist Inji Efflatoun (1924–1989), whose sparely delineated landscapes and scenes of rural life, reminiscent of the French Nabis, vibrate with a strange intensity. And surpassing Curiger’s attempt to draft Tintoretto into the realm of contemporary art in 2011, or Gioni’s corralling of such left-field figures as Rudolf Steiner and Carl Jung two years ago, Enwezor has given himself the honor of being possibly the first curator ever to list Karl Marx among his participating artists, as the show also includes a marathon reading of all three volumes of Das Kapital. What does this disarray suggest about the “state of the world” now, or the possible futures it contains? For anyone who spends a few days tramping through these halls and their hundreds of pieces, the question is liable to seem moot: No coherent viewpoint emerges, either on the crises of the present or the idiom in which contemporary artists can most effectively respond to them. In the end, we are left not with a grand exhibition, but with individual works by particular artists (or collaborative groups) that seem to offer something more than could be hoped for in the face of Enwezor’s false dichotomy between “interminable commentary on the state of the world” and a “stance of radical refusal,” of “disengagement and distance”—a place within the world that lets us see it again as if from the outside, where its strangeness, beauty, and horror are once more perceptible. A place where stone, as Viktor Shklovsky once said, can be stony. Such art lingers in the mind, even when encountered in the distracting environment of the Biennale, because it creates an ambiguity between familiarity and strangeness that is innately fascinating. Among these works was Steve McQueen’s double-sided video projection Ashes (2014–15). We see lyrical footage of a beautiful young man in a boat; he seems to glory in the sunshine under the gaze of the camera, which bobs and weaves with the rhythm of the waves; in counterpoint, we watch what might be a how-to video on preparing a grave and building a simple, inexpensive concrete monument to place on it. A voice-over—spoken in thick Caribbean accents that are, at times, very hard for an outsider to understand—tells the tale of how this young man, Ashes, a Grenadian fisherman, found a hidden cache of drugs somewhere and, presumably, sold it. Later, a group of men came looking for him. When he refused to go with them, they shot him dead—a simple, senseless death. Ashes must have known it was coming. But if it had to happen, he wanted it to be a kind of spectacle. The narrator recalls Ashes’ words to his murderers: “If you have to kill me, kill me here in me people’s presence for them to see, I’m not going anywhere.” The spectacle of the killing is not the one we see; what we witness is the sober, humble work of preparing the earth to receive the body. The metrical noises of the preparations at the grave site become a kind of consolatory music. Isaac Julien’s Kapital (2013), also a two-channel video installation (the images are screened side by side rather than back to front), could hardly be more different from McQueen’s: The focus is not on the enigma of one individual’s life and death, but the enigma of how to represent an abstraction such as “capital.” Most of the footage was shot at a public interview that Julien conducted with the geographer and Marxist theorist David Harvey (whose bright-red sweater vest shows him to be as unorthodox in his fashion sense as in his ideas); their conversation is intercut with found footage. Here, although the concept of “capital” may never become graspable in images, a lively visual rhythm is established that lends the dialogue about it a kind of sensuous form. What might have been a dry document becomes enthralling through the sheer dynamism of Julien’s editing. Since first seeing his feature film Looking for Langston in 1989, I’ve always thought of Julien as an aesthete, a cinematic sensualist. I was amazed to see that he can also approach the least sensual material imaginable in a beguiling way. Another surprise offered in “All the World’s Futures” came by way of some paintings by Lorna Simpson—a surprise, in the first place, simply because they were paintings, for Simpson is, as the catalog notes, “a pioneer of conceptual photography.” With their hazy washes of graphite and ink, the paintings depict isolated figures in nebulous spaces—yet Simpson somehow ensures that these figures always appear to be concrete individuals, however inscrutable, and not abstractions. The paintings are somber, yet with an inner vitality that feels indomitable. Simpson’s apparent ambivalence is probably as good a response as any to the current state of things and our potential futures. Yet the most articulate response I saw in Venice was not in “All the World’s Futures,” but—all favoritism aside—in the US pavilion. There, Joan Jonas’s video installation They Come to Us Without a Word—lush, densely layered, as if a primordial relation to sight and sound could be filtered through the most contemporary technology—struck me as a magisterial summa of both her work as an artist (now for nearly 50 years) and the ever more widespread realization that the damaged relations between humans and the nature of which they are a part have become irreparable. Jonas conjures a world in which bees, dogs, fish, children, and ghosts all go about their mysterious business in mutual obliviousness—yet there’s an accord to their coexistence that is utterly precarious but necessary. As my daughter, who is part of this story, wrote in a school essay about a 2013 performance of Jonas’s Reanimation: “I felt as if I had discovered something no one I knew had ever seen or realized before, as if I had been brought into a whimsical world of wonder and strangeness, and found that I belonged.” There are other pavilions in the Giardini in which the artists seem to want to counter the surrounding brouhaha with the restorative calm of an aestheticized minimalism—Heimo Zobernig in the Austrian pavilion, Pamela Rosenkranz in the Swiss one—but Jonas succeeds on a larger scale than any of the rest in incorporating the world’s noise and disorder, perhaps its ultimate decay, into an eerily discordant hymn to endangered life.